This entry was posted on May 27, 2009 at 1:19 am and is filed under Dating the VMs. You can follow any responses to this entry through the RSS 2.0 feed. You can leave a response, or trackback from your own site. You can read the entire post, here. Well, I would word it differently… let’s say, people will try to put the image in “context”. If I assume the VM is pre-columbian, then identifying the creature as an armadillo would make no sense. In any case, I opt for pangolin for the simple reason that the creature depicted seems to have pangolin-like scale armour, not rings as are characteristic of armadillos. Well, I would word it differently… let’s say, people will try to put the image in “context”. I suppose it can be worded many ways (and I would agree your wording is accurate), but the meaning is the same. A pre-conception of what that context is, i.e., pre-Columbian, is clearly driving the opinion “it’s not an armadillo”. Since this needs to be done so often with the pre-Columbians, in such imaginative ways, my opinion is they ought to look hard at the preconceived context which demands it. It reminds me of the old joke where the woman finds her husband in bed with another woman. He says to his wife, “What are you going to believe, me or your eyes?”. …seems to have pangolin-like scale armour, not rings as are characteristic of armadillos. If you look at my page of armadillo images, you will see that they are not all ringed. The scaling of some is quite close to the f80v animal. Could it be a pangolin? Sure. I don’t know… but the point is, I, along with most of those open to all dating, think it is an armadillo. I absolutely agree with you on that. And the number can be raised or lowered by choosing the group. But as I said in the original post, the point is that in these two groups: Pre-Columbian and all others, the pre-Columbians universally either say it does not look one, or ascribe a reasoning to explain why it looks so much like one, and which still avoids newer dating. All of those reasons are off the chart, IMO. For everyone else, they usually think it looks like an armadillo. But also, again, none of this makes it an armadillo or not… it is what it is. It’s the response I’ve gotten which is the treasure in this, to me. Those sunflowers look a bit like maize. Could the “armadillo” be a visual interpretation of a fossilised trilobite? The strokes in that image remind me of some of the doodling of Leonardo da Vinci. I like your idea, too, about the fossil. Of course fossils have long fascinated mankind, probably since pre-history. The Greeks may have based some of thier mythology on it. I’ve seen representations of fossils on Hellenic pottery, and fossibls have been found buried under temples. On the latter, I understand they were first dug up and discarded, by early archeologists, in a great case of “The Purple Cow Syndrome”. As for Da Vinci, you should check out the work of Edith Sherwood, if you have not already. She believes a young Leonardo may have been responsible for the Voynich… although like all theories, there are many detractors, I will not be a Purple Cow farmer. There are only one or two theories I believe, absolutely, would be wrong, and I always keep the other million or so in mind when pondering on this. It does help me, Joaquin, and thank you so much. I had not seen that one before. Take care, Rich. I had never heard of a pangolin before I posed this question, either. I know many feel it is one. Not to be argumentative, but one reason I favor armadillo is the tail… the pangolin has a fatter tail, as more an extension of its armor, whereas the armadillo has a slender tail. 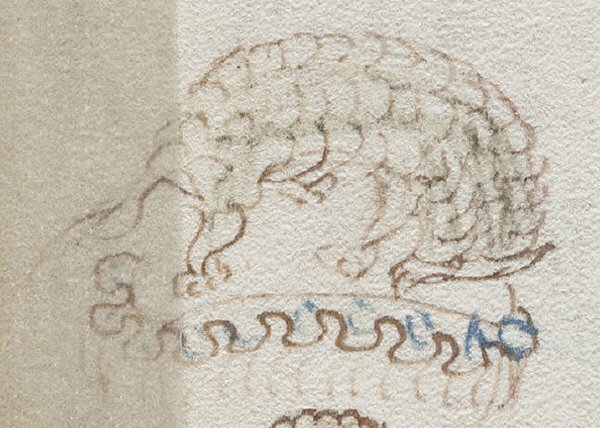 Also, I do not believe pangolins “curl up” like armadillos do, and as the voynich image seems to suggest. So armadillos were actually known to Europeans earlier than pangolins. Well I’ll be damned. Thanks much, Lars.